And so the (not so) epic conclusion of last weeks cliffhanger! Kinda. And I feel bad, but drawing Jeff sad is just fun, haha. Alas, no baby pictures of lil Jeff. 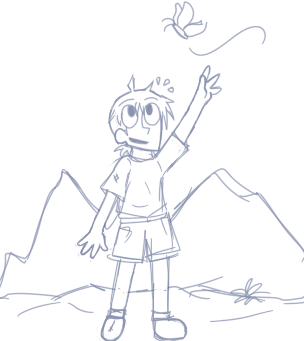 But here's a small quick doodle of kid Jeff, just because! T'was a hard page to finish, I got sick over the end of the weekend. What the hell? I see a lot of people on CF sick. A lot of my friends off CF are sick. Now it's gotten to me, too. Is the world ending?! Is WA going to be a reality?! I want back tentacles. I want wolf ears and cat eyes!!!!!!!!!!! great page i like his sis. Aw man... Now I'm hoping his sister appears in some fashion or another. It's true, he is pretty much the same! ...Kinda. I had a lot of fun drawing the sister, tho! Hmmmm am i sensing a sudden reappearance needed? She must come back! make her old or really different from grief! you are really starting to endear your characters to me. Jeff; right now especially. Heheh, thanks a lot mate! Even though I wrote him into this, I want to go give him a hug...hahaha. His sister and a hug, that's what Jeff needs! Awww q.q he looks super different when he is alive. I love that picture in the locket. I'm sure it's bitter sweet for him. Yeah. :( Definitely a bitter sweet memory. Poor Jeff! I like the sister. She looks like a female version of Jeff. They're even the same height.